Eric's Review - This is actually pretty decent card. 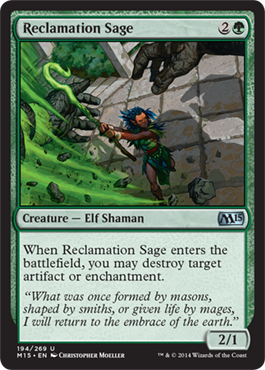 A 6/5 for six mana is okay, but it is better because you can regenerate it. 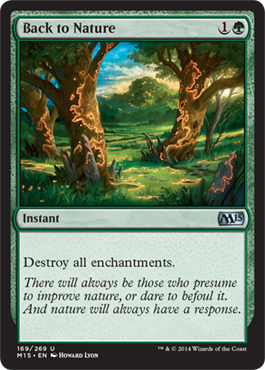 Eric's Review - A two mana enchantment destruction spell, especially right after Theros Block? 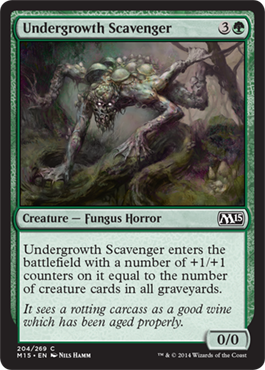 Well, this definitely makes for an interesting card in Modern, especially with Bogles being decently popular. 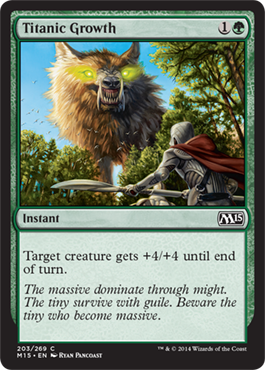 Eric's Review - Built in "only blockable by two or more creatures" is good, and combined with a 4/4 is pretty good, especially in Limited. Eric's Review - This reprint is quite good, especially considering the original price. 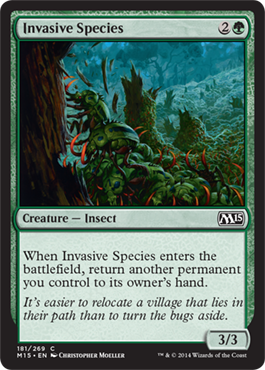 And you can search for creatures by tapping creatures, which is good. Eric's Review - Mana dork. Always good to have. 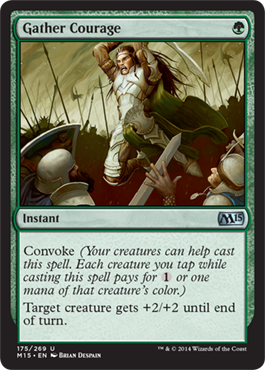 Eric's Review - Nine mana for a total of nine toughness is great, and with Convoke being able to reduce the cost is pretty amazing. Eric's Review - Eh... 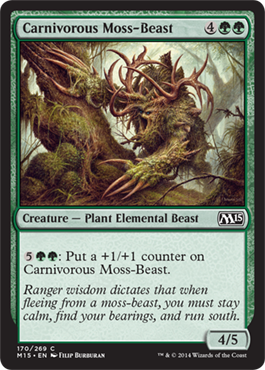 Giant Growth is better, but all we get is Titanic Growth in M15. 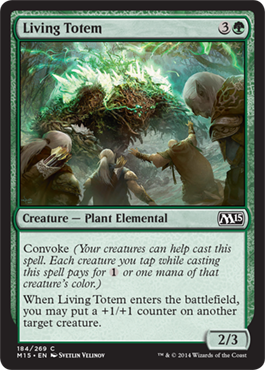 Still, I suppose it isn't bad, especially if while you're out of mana, you can tap a creature for the boost. 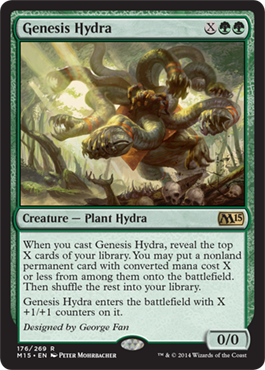 Eric's Review - Ah, Genesis Hydra, the first externally designed card revealed. 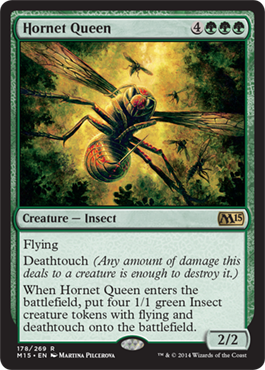 It is strongly powerful given that not only you get a */* creature, but you could also get a creature that costs the same as X. 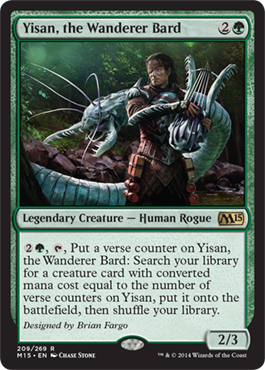 This is hugely powerful and I expect it to be one of the better hydras in existence. 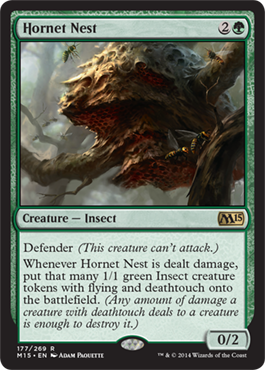 Eric's Review - So a 0/2 defender that creates tokens. Doesn't seem great, right? Did I mention the tokens are flying deathtouch tokens? Perhaps a newer, better Boros Reckoner in a way? Take damage, make tokens that kill everything else. Good good. 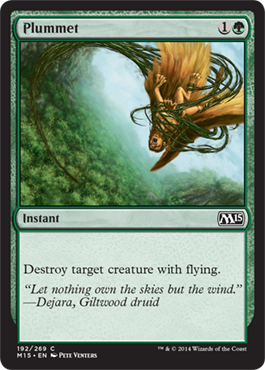 Eric's Review - Seven mana gives six power split into five pieces, each with flying and deathtouch. Definitely good. Eric's Review - A bit costly for this spell. 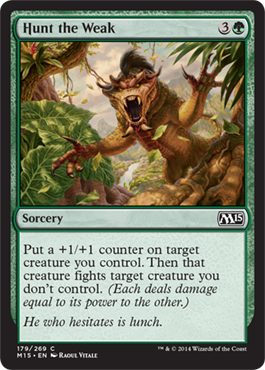 Four mana for a counter and for a creature fight? No thanks, not interested. Eric's Review - Green card draw. Seems good, definitely. Eric's Review - It's not bad, but it's not completely amazing either. 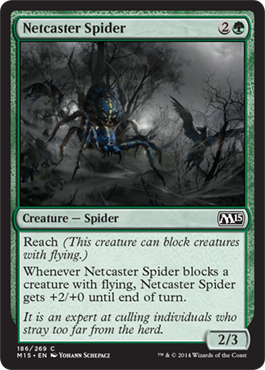 Can boost an already existing creature that can attack, so it isn't too bad, but definitely better for Limited. 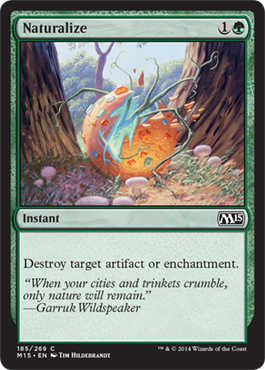 Eric's Review - Artifact/Enchantment destruction comes standard with all Modern core sets. 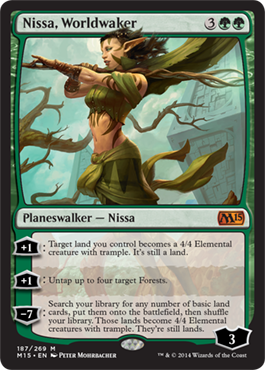 Eric's Review - Our fifth planeswalker of the set is the second version of Nissa. 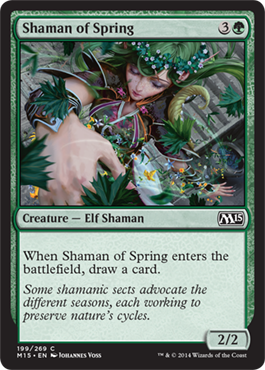 This is absolutely a wonderful planeswalker. 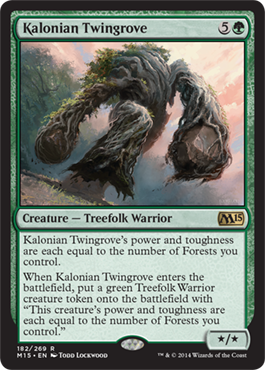 Two +1 abilities with one that turns lands into creatures and another that untaps Forests. 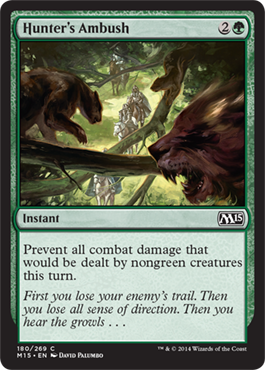 Of course the loyalty counters start off pretty low, the -7 ability is pretty powerful because you can take all basic lands out of your deck and make them creatures. 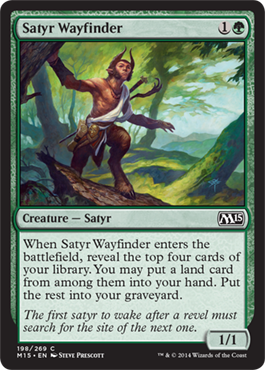 Definitely one of the best Planeswalkers in the set. 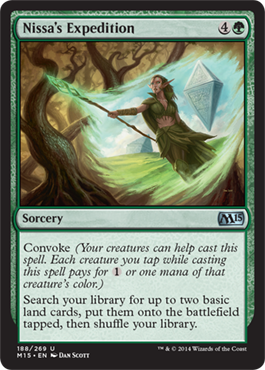 Eric's Review - This is also pretty great because you can use Convoke to bring in more lands is really powerful. 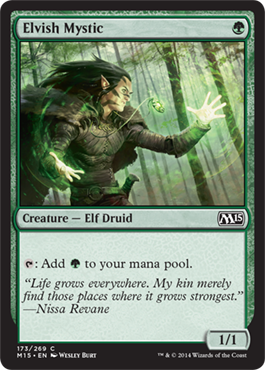 Also by playing Nissa, you would have enough mana to cast this too. 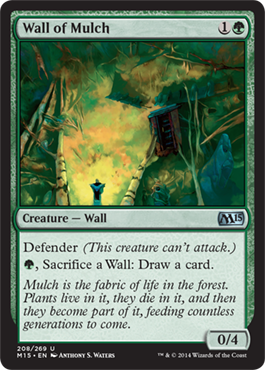 More lands on the field means more 4/4 Trample creatures. Eric's Review - The last Paragon, we get Trample. 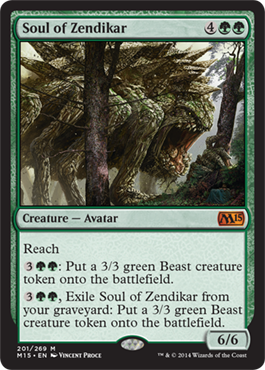 Not too bad at all, especially with the huge creatures available to you in green. 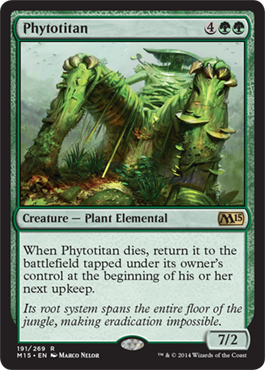 Pair it with Phytotitan and you can do a ton of damage. 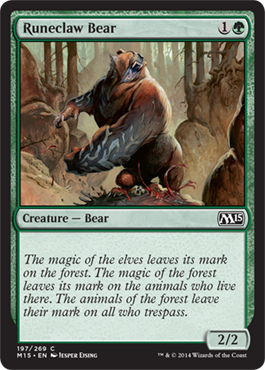 Eric's Review - A creature with seven toughness, but easily killed. The redeeming cuality is that it will keep coming back at the beginning of your next upkeep, but it will come back tapped... 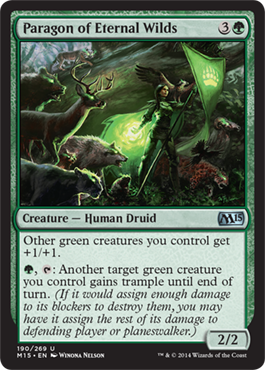 So not so great there, but being able to make it have trample or any other boost with other green spells of abilities on green creatures is great. 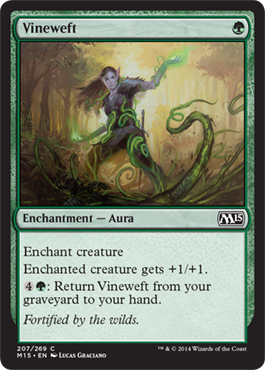 Eric's Review - A pump spell that frequently shows up in core sets, boosting a creature and giving it hexproof can be amazing considering there are a ton of kill spells out there. 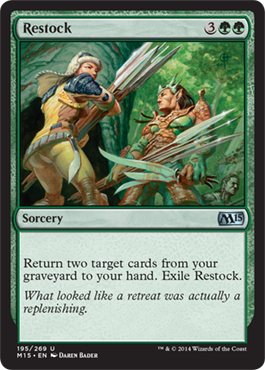 Eric's Review - Good for a Dredge deck, I think. 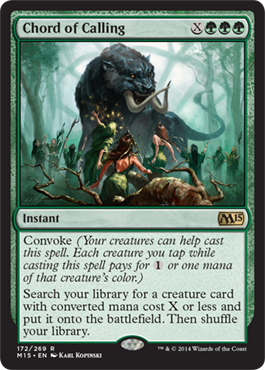 Eric's Review - This could pair well with enchantment creatures with constellation or creatures wit h"Enter the Battlefield" effects. For that, it's good. Otherwise, a 4/4 for four mana is actually pretty decent. Eric's Review - The standard, vanilla bear. 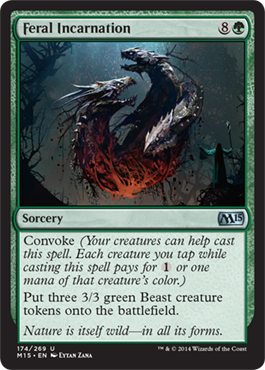 Eric's Review - Not a bad creature, especially when Convoke is thrown into the mix. 5/5 Trample for seven mana is pretty great. 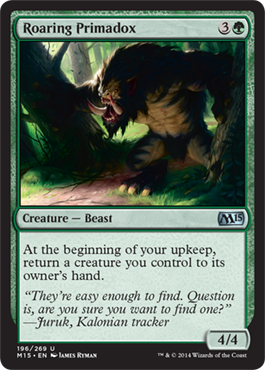 Eric's Review - The fifth Soul, five mana for a 3/3 beast is a bit much, but with nothing better for that mana to do, seems good. 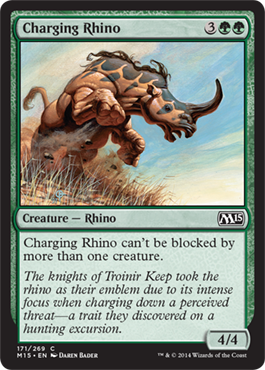 Also with the U/G mana deck possible in Standard, putting beasts on the battlefield shouldn't be a problem. 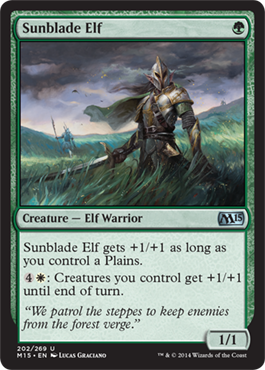 Eric's Review - Effectively a 2/2 by turn two, Sunblade Elf is not at all bad. 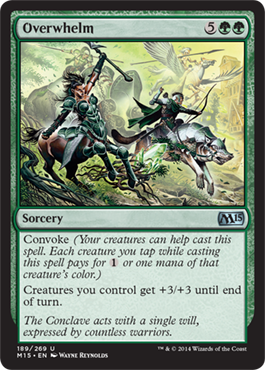 Also considering you can give all your creatures +1/+1 for a turn is a big plus. Eric's Review - Dredge material. 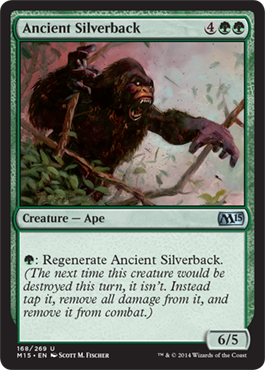 Play it early to maximize it, then bring back creatures from your graveyard. Since it only checks at the beginning and not constantly, this is a pretty great creature. 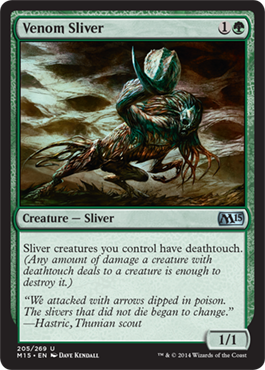 Eric's Review - The fifth sliver... Deathtouch for all of them, a 1/1, and only two mana. Love it! 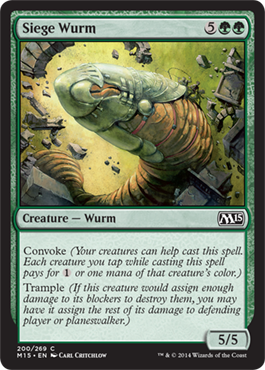 Slivers decks just became a ton better. 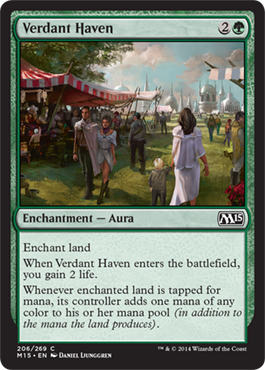 Eric's Review - Land enchantments for mana ramp. 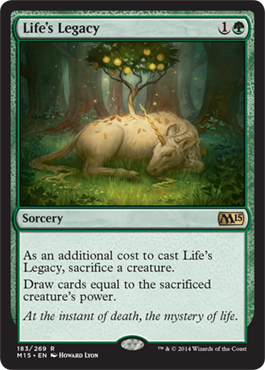 Life gain doesn't hurt either... Third printing, second in a core set, and when Gatecrash rotates out of Standard, we get to keep it. Eric's Review - Brood Keeper (red) would love this since it is cheap and you can always return it to your hand and keep recasting it for more dragons. These connections are pretty sweet.